Don’t be scared of the high part count! KSP 1.1.3 is faster than ever before and 1.2 will be even faster! I get 8 FPS on my old Pentium! A month ago I discovered that with enough force, certain joints can be bent and freeze in that position, like is normal for a lot of materials in real life and KSP being the oddball exception. I wondered if it’s a new feature and I wanted to test everything. So I started to build a car but ran into a problem regarding scale. Then the Yllions came for a visit and agreed to show themselves for the first time. 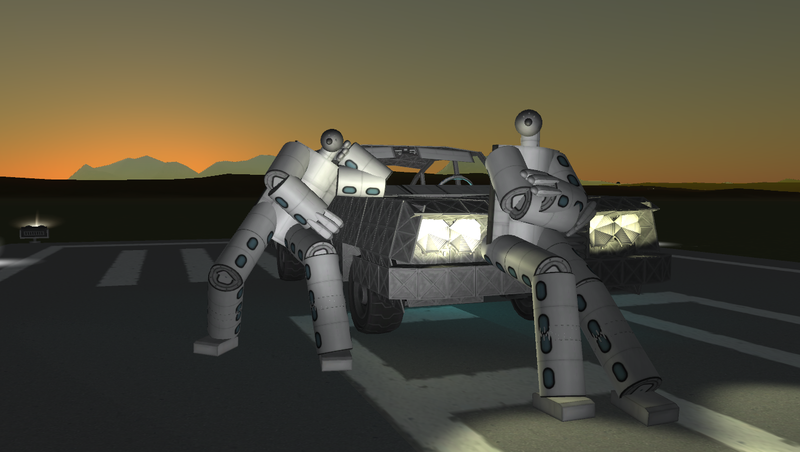 These extremely large, three eyed aliens agreed to test some road vehicles on the planet Kerbin. They can’t do it on their own planet (according to them: Filthy bureaucrats! ) because they like to crash & smash cars, themselves and even buildings to pieces, and being as large as they are, would involve even more piles of paperwork than on Earth. And because bureaucracy is non-existent on Kerbin and there’s no regard for life anyway, they have a green light. In the album you’ll see pictures of accidents at 70m/s … Due to the scale and mass, it’s comparable with 70 kph. The car was designed as a mashup of styles popular in the USA from the early 1960’s to early 1980’s. I think it’s fair to say it drives like one too. A mod giant car called 77I- Crash Test Simulator v1. Built with 1123 of the finest parts, its root part is structuralPanel2.